I had the opportunity to take part in a reconstruction of an accident in order to help the Manchester Fire and Rescue Service train. The fire service obviously spends much of its time putting out fires yet a more and more valuable service they also provide is in assisting with accidents particularly on the motorways. Hence the word rescue in their title. Fires do happen all the time but with increased public awareness, health and safety and extensive use of smoke alarms many fires are prevented or they are often put out before they become a major problem. The fire station in Ashton is perfectly positioned right next to the M60 so they have easy access to any accident that may happen on the motorways in the Greater Manchester area. I was going to spend the day there as a volunteer to be part of a staged accident to help members of the team learn how to manage a major incident. 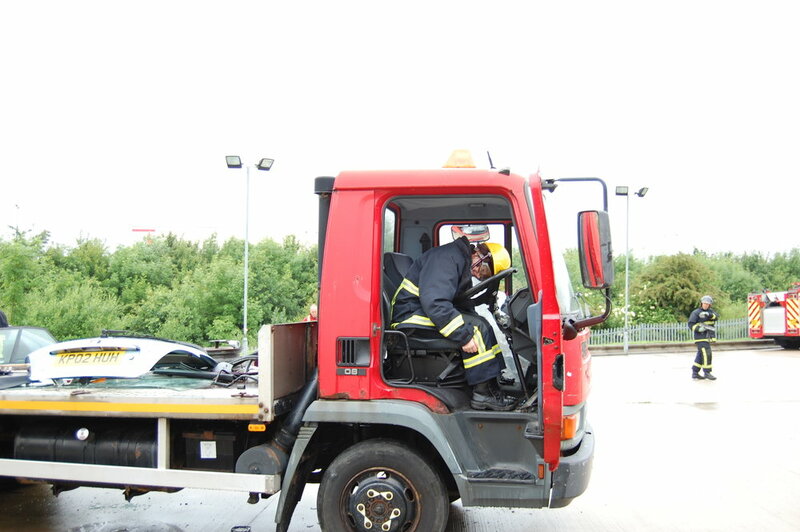 Last year I had visited Hyde fire station in order to find out more about the fire service in the Tameside area and had volunteered to be cut out of a car so the fire fighters could practise skills that they may need in an accident. I just assumed that during a car accident getting someone out of the car was quite straightforward. However, those rescuing people out of often quite mangled cars need to be able to retrieve the person with the minimal risk of injury. It is to ensure that the airbags aren’t accidentally triggered as this may frighten people within the car or indeed caused further injury when they go off. I lay in the car with the side crushed in and I thought about what it must be like to be trapped inside a car and how frightening it must be. This could happen to anyone at any time. Those training were extremely kind. They were reassuring throughout and told me each step of the way what they were going to do. As long as the person remains stable the fire service will do everything they possibly can in order to get the passenger out without increasing the chance of further injuries or making any current ones worse. However if the person’s health was to deteriorate it would mean that the person would need to be taken out more quickly. I arrived at Ashton fire station quite early only to find lots of firemen and women having their toast and tea waiting for instructions. I was taken into a room and briefed. I was to be a 50 year old man trapped in a lorry. At some point during the enactment I would be given a signal and then I would fake a heart attack. While the cars were being prepared in the car park, some on their sides or completely over turned, I accidently blurted out that I was going to be a lorry driver. Luckily no one heard me. It wouldn’t be good if those training had any idea what was about to happen. I must learn to keep secrets better. Those taking part in the training went a short distance away so they could arrive on the scene. I was taken to my lorry and I climbed inside. The other volunteers were put inside their vehicles. The scene was set and it went silent. It wasn’t long before the fire engines arrived. They quickly made the area safe and checked on each of the passengers of the vehicles to assess their priority of needs. They quickly established that I didn’t have any injuries I was just shaken. It was very strange for me to play an older man when clearly I was a younger woman and I kept getting confused of who I was meant to be. Again the fire fighters were extremely kind and reassuring and made me feel I was in safe hands. After a while the signal was given and I did my best Oscar-winning performance of having a heart attack. Within seconds the fire fighters noticed rushed over and dragged me out of the window. They then began CPR and used a dummy defibrillator. Even though I knew it was only a practise it was quite alarming to have your heart restarted. Having been saved I was then able to watch the rest of the re-enactment. One car had completely flipped over and had a pole going through the car itself. The fire fighters spent a long time pulling apart the car piece by piece by until it was fully open like a tin can. They got each of the volunteer passengers out and after the enactment they went off to debrief. It was an honour and a pleasure to be able to help the fire fighters of Tameside. Not only is it nice to know there will be friendly, helpful and incredibly competent men and women to help you should you have an accident on one of the roads of the Greater Manchester area but that if you happen to be sat in traffic cursing why the accident isn’t being cleared up more quickly, remember to have patience as fire fighters may be doing everything they can to save someone’s life.